One small but significant item which illustrates the relationship between maps and adventure is the delightful map drawn in September 1887 by John George [Bartholomew] as a 9th birthday present for Winifred Cox (1878 - 1905). Robert Cox, M.P., of Gorgie, Edinburgh, had leased Rossdhu House, Luss, on the banks of Loch Lomond, for four years. 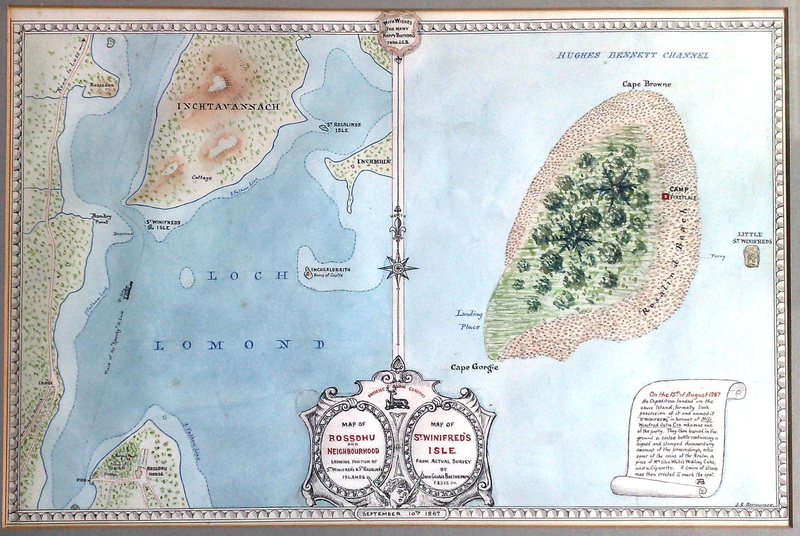 John George made the house his headquarters while undertaking some survey work in the area, possibly as part of the Royal Scottish Geographical Society’s, Atlas of Scotland published in 1895. On 15th August 1887 an “exploratory picnic” as it was called by Winifred’s brother Harold was held. Where better place for such a venture than an uninhabited and un-named island. 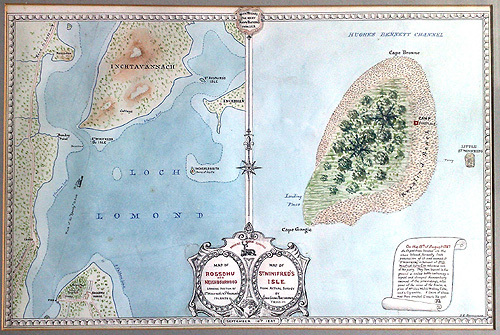 After all Treasure Island had first appeared in book form only four years earlier, and the cartography for the map of [Treasure Island] had been done by Bartholomews. A full explanation of the events of the day is given on a scroll forming part of the map made by John George and given to Winifred to celebrate her birthday. Click here for close-up. Note: the location of the cairn has been removed. In the use of the “f” for a second “s” in Miss, John George implied elements of an ancient map as betokens an “expedition” and obviously fully entered into the fun of that day. The fun was to last however as in Bartholomew’s Half Inch Maps of the area, the island continued to be called St Winifred’s rather than follow [Ordnance Survey] usage. Even today can there be any better way of introducing a young person to the lasting joy of a spirit of adventure and exploration than an exploratory picnic and a map to remember it by.